He slowly pried open the lid, and the tantō glinted madly in the half-light. The executive motioned to the blade. Looks like the meeting was being cut short. Clean out your desk: There are currently 22 sysops, clones or executives that Restoring Face can interact with to remove up to 2 bad publicity. Elizabeth Mills probably represents the strongest synergy basically bringing the total bad publicity removed up to 3, recur her with Archived Memories, Jackson Howard etc for even more. Clear up bad publicity from ice: Checkpoint, Fenris, Grim, Muckraker, Shinobi, Swarm, all are powerful ice which unfortunately are semi-self defeating in that they confer bad-publicity which the runner in turn can use to better navigate ice for the remainder of the game unless cleared off in some way. Clear up bad publicity from agendas: Geothermal Fracking, Hostile Takeover, Posted Bounty, Profiteering, Project Ares, Vulcan Coverup all have the negative side effect of inducing bad publicity, Restoring Face could be decent compliment to any of these. Bad publicity from assets: Reality Threedee is an example of an asset that unfortunately confers a bad publicity when rezzed. Completely flush resources : With the prevalence of Data Leak Reversal for example Restoring Face can be used to clear off bad publicity ahead of using The All-Seeing I to completly wipe the board of all the runners resources, which unless the runner had 3+ bad publicity on the corp this would be unpreventable. Efficient Double Duty: Clearing 2 bad publicity in addition to trashing an upgrade or asset that is no longer pulling it's weight helps the corp by providing a bonus to an activity that was going to happen anyway. Economical: At 0, a sysop, executive or clone merely need to be installed, not even rezzed in order to combo with Restoring Face. Co-dependent: Restoring Face is useless when played independently. 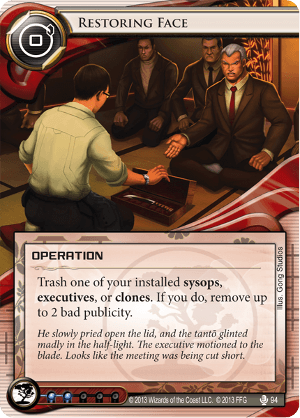 Costly: Trashing an installed & rezzed sysop, executive or clone may represent significant lost of sunk cost and possibly drag on momentum depending on ability that will no longer be conferred by the trashed card. Restoring Face's thematic flavor alone is noteworthy, any deck that focuses on removing bad publicity would do well to consider it alongside (or in combo with) Witness Tampering, Elizabeth Mills & Exposé among other options available in the meta. So, hey the company was needing to downsize anyway right?